Flash: Propagation Editor NW7US says his original prediction of poor conditions for the CQWW CW weekend in late November turned out to be too pessimistic, and updated data suggest much improved conditions for the contest. 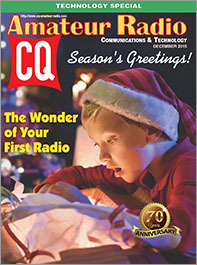 Once again, the December issue of CQ features our annual Technology Special. This year, we cover a wide range of technical topics, from a bit of history ("Ham Radio Since 2000 - A Rip Van Winkle Story") to what's on tap for January's "Quartzfest" ham gathering and training session in the Arizona desert. We also continue our series on microcontrollers and share one ham's experience with building a single-band shortwave receiver with leftover components from a Knight-Kit Star Roamer "parts radio." Speaking of kits, we highlight Heathkit's return to the marketplace (no ham gear just yet) and take a quick trip around New York's World Maker Faire. 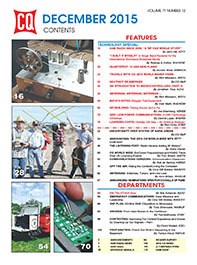 We also look at readers' antennas, introduce antenna analyzers in our "Learning Curve" column, and WA2NDM checks out some "bargain test equipment" in this month's "Math's Notes" column. It's not all technical, of course. We also have a news report on the uncertain status of Hara Arena, home of the Dayton Hamvention; a moonbounce DXpedition to Micronesia, a look at ham radio in Ethiopia, and the rules for next year's CQ World Wide WPX RTTY Contest. We also have our annual index in this issue, for quick reference to every article that appeared in CQ during 2015. An updated Master Index from 1980-2015 will be posted here on our website in the near future. That's a brief look at what's coming up in the December issue of CQ. For information on becoming a CQ subscriber, at Happy Holiday Special prices . . click here. Happy holidays from all of us at CQ! Zero Bias –"Technology and Creativity"
On the Cover: Happy Holidays to each of you from all of us at CQ!